Rapid STD Testing offers Same Day STD TEST Results for HIV, Chlamydia, Gonorrhea, Hepatitis B & Hepatitis C, Herpes, HIV & AIDS and Syphilis. With our same day test results you do not need an appointment as you may call or order online. Rapid STD Testing knows this can be a stressful moment in your life and getting your results sooner than later will help you move forward. All Testing is private and CONFIDENTIAL as we know it can be difficult and embarrassing for you to visit your family doctor. With over 4000 locations nationwide we are the leader in rapid STD Testing and we accept all major credit cards, cash deposits, money orders and offer payment plans to accommodate any budget. You will also receive a complimentary pre/post consultation and for those who test positive we offer treatment options. So it’s time to stop the worries today and arm yourself with the knowledge you need to manage your life. 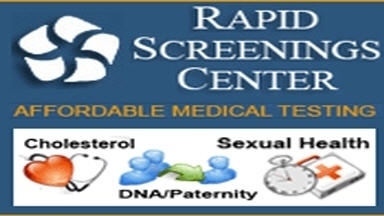 Call Rapid STD Testing today!